Tubing at Cardigan Bay Active01239 612133work RaftingOn this adventure everyone finds how thrilling the mix of white water and inflatable inner tubes can actually be! After spending many years heading down the rivers here, we have found the best places to go Tubing in west wales. For most of the trip you will find your self laughing with and at your friends as we play amongst water features at the mischievous mercy of the Teifi river's current. On this adventure everyone finds how thrilling the mix of white water and inflatable inner tubes can actually be! 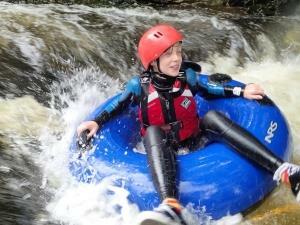 After spending many years heading down the rivers here, we have found the best places to go Tubing in west wales. For most of the trip you will find your self laughing with and at your friends as we play amongst water features at the mischievous mercy of the Teifi river's current.